A traditional blend of herbs and spices makes our Roasted Chicken Gravy Mix a deliciously familiar addition to all kinds of meals. Its irresistible flavor pairs with more than just chicken — try it with dishes like our Sweet & Sour Pork. Roasted Chicken is rated 5.0 out of 5 by 4. 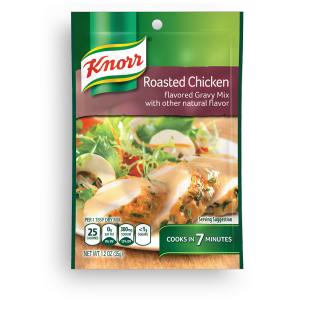 Rated 5 out of 5 by CarolB11 from Roasted Chicken Knorr is the best , the chicken gravy mix is wonderful , the flavor it adds to your meal with moistness and the gravy is the prime touch to your plate . Rated 5 out of 5 by Chrism355 from The Best Ever!! I use this for my "Famous Chicken Stew" and everyone loves it. Forget a thin broth when you can use the gravy mix. My family and friends love it. I do use it for gravy too as it is a great addition to a store roasted chicken with homemade potatoes. Delicious and very easy to use!! Love it!!!!! Rated 5 out of 5 by Sandi Sue from Simply The Best! This is a must for all kitchens! It's the best tasting packaged chicken gravy without being overly salty. Rated 5 out of 5 by Shamrock43 from Love the reviews I love all the flavors I have used them for many years,I do miss the pork gravy one.